RHYS BOWEN: I've always been amazed to see the number of comments we get here at Jungle Red when we feature a book to do with sewing or other crafts. I've never been in a Michael's craft store when it hasn't been busy. So it's fascinating to note that in this age of the cheap ready made, when you can buy a perfectly knitted sweater from China for twenty dollars, crafts still matter to us. It's clear we are programmed to work with our hands. All those industrious ancestors who had to make their children's clothing or the child would run around in rags are driving us to carry on the skills, just in case. Crafts are so important in making books into best sellers that my agent once jokingly suggested that I do a big World War II thriller that involved knitting. Or maybe she wasn't joking? So for my Saturday list today I wondered what crafts my fellow Jungle Reds enjoy doing? and of course I love to paint, both watercolor and oils. And Lucy, lavender sachets! With home grown lavender? I'm terrible at crafts. Truly awful. I think this is related to the fact that I also can't make a bed. Impatience doesn't help. Though I did quite a bit of crocheting in my 20s. And some quilting and embroidering, which I learned to do in elementary school. We cross-stitched a sampler on gingham and embroidered a map of California. I wonder with all the cuts if kids get any of the cool art projects we had. HANK PHILLIPPI RYAN: Nothing. Zip. Terrible. (I can crochet, and used to make baby blankets and afghans all the time, with great delight. My Gramma Minne taught me to knit, and I've made sweaters.) But ah, these days, I gotta say, I think yarn is gorgeous, and I love craft stores. My reaction, however, is usually: "I wish I knew what to do with all this stuff." Does flower arranging count? I'm pretty good at that, and love when the flowers come from my own garden. How about--magazine-stacking? (I have perfected that.) Does towel-folding count as a craft? RHYS BOWEN: Flower arranging, Hank? Now that is a skill I fail at hopelessly. I put them in a vase and they sag in all directions. Pitiful. JAN BROGAN: I embroidered during my high school years -- flowers on faded blue jeans mostly. And actually knit Icelandic sweaters in my twenties. The reason I knit Icelandic sweaters (they are the heavy monotone but multi-color ones) was because I needed a pattern to keep me engaged or I stopped paying attention when I knit and it got ugly. Real ugly. 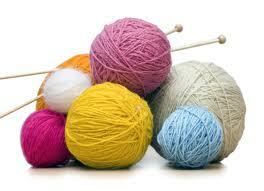 I actually think knitting and other repetitive hand crafts are a form of meditation. But no -- I don't do it anymore. But I play a lot of guitar - and that's my hands, right? ROSEMARY HARRIS: Icelandic sweaters? Lavender sachets? Wow. Most of my craft chip goes into my garden these days - planning colors, heights and leaf textures. I used to knit, as long as it was a square or a rectangle. Crocheted a quilt once, made a shawl once and a mosaic table top. Had brief flirtations with shell art, chinese brush painting and jewelry making. Now I'm with Hank...does china stacking count? Re-arranging the vase collection? Hank, since you're so good at towel-folding can you give me any tips on folding a fitted sheet? Few domestic activities are as exasperating to me. JULIA SPENCER-FLEMING: What I can do: sew, simple garter-stitch knitting, embroidery, needlepoint. What I do do: ....uh..ironing? The knitting dropped out after college, and I stopped sewing after I had my second child. The needlepoint lasted until my writing career took off, as the many bargello pillows in my house can attest. What's interesting is that my youngest daughter is expressing a keen interest in all these traditional crafts. For Christmas last year, she embroidered a handkerchief for each member of the family with a design and an initial. If we can clear a sewing space out of her increasingly unused play room, we're going to set up my machine and haul all the boxes of fabric and trims out of the attic. And a friend has offered to teach us how to knit! So who knows, I may be returning to the days of crafting. DEBORAH CROMBIE: Hopeless. My lovely grandmother sewed and knitted, and gave up trying to teach me either. I swear the old Singer had a grudge against me, and knitting needles drove me to want to commit murder. I'm a decent amateur photographer but lack the drive and technical skill to be really good. But--there is a but--I've wanted to make a quilt since I was in my teens and my grandmother and I day-dreamed about the quilt she'd buy me some day. I have a friend who's a brilliant quilter and who has encouraged me to actually give it a try. I wanted to do something that would give me quiet time, that would disengage my brain, and that was neither work nor chores, for those things seem to take up the majority of my life. For months my friend helped me collect fabrics and work out a pattern. Finally, this Sunday, with much coaching, I cut and then hand-stitched my first few bits of fabric together. It felt like Christmas. I suspect, however, that this will be a loooooong project. RHYS BOWEN: You're right, Jan. It is a form of meditation. I love to sit in front of the TV on a winter night and knit, making sure my brain winds down. So let's hear from our Jungle Red visitors: are you crafty? What is it about crafty cozy mysteries that so attracts you? And since this is the pub week for my new book, Naughty in Nice, please go to my website and, if you've bought my book, do enter the contest for a fun and fabulous French themed prize. Looking at this list, I've decided I must be a competitive crafter--I want to do it all (and more than anybody else!). I knit (Aran patterns, of course), sew, cane chairs, stencil walls (and hang wallpaper), do both crewel embroidery and needlepoint (my mother and grandmother did), and made several quilts. I've developed my own black and white photographs, though not lately. This past couple of weeks I've been reupholstering chairs. See what happens when I don't have a deadline looming? Somebody stop me now! I want to know more about the beading, too. Is it jewelry/peyote beading, or sewing beads on clothing? When I was younger I took every kind of crafts class, bought every kind of craft utensil and supply, and tried a little of everything, from rya rugs to huck towel embroidery. Always came back to garment sewing. However, I've made many small quilts, and now one full-sized bed quilt, and those are also very satisfying. Can canning be considered craft? If so, then that's my newest venture. The hardest part was to find a canning rack, of all things! We just ate some of my red onion marmalade, made from onions from my garden. Oh, yum. Sheila and Karen--You make me feel exhausted and/or inadequate just reading about your projects. I paint and do colored pencil pieces, but it's been a while since I had the time. Does weight-lifting at the gym count as a craft? How about helping my HS freshman with biology projects? Laura, it helps that I'm turning 60! And that I started with the help of two crafty aunts when I was very young. Hmmm, for me, ixnay on the crafts. I sewed a pair of culottes (remember culottes?) once. The first day I wore them they came apart. Appparently baste stitches aren't the end of the process. Who knew? I don't bead because my sister-in-law does, taking care of all my necklace needs. I can (and do) cook. My garage is so organized it's the envy of the neighborhood. I rake leaves like a fiend each fall and shovel extraordinarily neat walkways in the winter. When I lived in a house with a woodstove I was a champion wood stacker. Crafts -- not my skill set, but I admire those of you who can do all that great stuff. Rhys, I knit and crochet (even making money for a while by designing and knitting multicolored lace shawls of handspun). I spin on wheel and spindle and weave (mostly tapestry and Navajo). I traded one of the ocuhes in my big living room for a floor loom. I make art quilts loaded with embellishments. (I'm a firm believer in "more is more.") And I love to sew things for the house and purses. Since I've been trying to meet deadlines with this mystery series, however, I only do a little lace knitting and spindle spinning. Have to get back to all of it, though, before my whole house drowns in all the stash. Let's see...counted cross stitch, sewing clothes, card making, letter writing (mostly to family - gotta send those handmade cards to someone), knitting, and quilting. I think that's it. Quilting - while I have given several to good friends and family, I made several for myself. I don't own a store-bought blanket. After I made a couple of quilts for myself I donated my ready-made blankets. Card making/letter writing - I send family and close friends that have moved away, a card with a letter every two months. I send about 25 cards (not including occasion cards). I'm trying to keep the post office solvent! I have been trying to think about what draws me to mystery books with a craft theme, which got me to thinking about theme and plot. I'm drawn to some of the craft-themed books because I can identify first with the craft before I love the characters. By the time I am part way through the book, I have grown to love the characters. Then I keep reading the series because the characters have become my friends and the crafting becomes secondary, and yet it is something we have in common. I have never tried to knit, but I like to sketch, with colored pencils, my characters. When I received my first rejection letter, I was sad, but I sketched my favorite guy from the story and his smiling face staring back at me made me feel better. Linda Rodriguez, impressive. I bet you don't shop often at Michael's. Seems that what passes as craft there is so often just a packet of pieces to glue together. Weaving, spinning quilting--those are the real thing. Like your Malice Domestic award! I like quilting best when I'm working with friends. So relaxing. I quit smoking many years ago by crocheting lace curtains at political meetings. Couldn't smoke and crochet at the same time. Those with crafts - do you incorporate them into your novels? Yes, Skipper, crafts are a terrific diet method, too. You cant knit or crochet and eat! ...I hadn't thought of it as a diet aid. I may want to unearth that crochet hook. Hank, That's why I need to get back into it. Unfortunately, I can write and eat--and not even be aware of those calories. Skipper, I go to JoAnn's or Michael's for picture frames, stuff like that, but not for yarn or fabric. That's why I spin. I like the high-quality luxury fibers and handspun yarns and can't afford to buy them in their finished forms. Nancy, A key character in my series owns a fiber arts store and goat/sheep fiber farm and the protagonist knits, but crafts are not front and center--they're a part of the entire background, as is food. Flunked knitting, crocheting and tea towel hemming in Girl Scouts. Used to embroider and liked quilting. Now I make "firestarters" using sawdust, melted wax and dried weeds and flowers. It's impossible to buy sawdust anymore except the kind used for animal bedding, like for hamsters and guinea pigs. I did have fun with crafts at the camp I attended with my granddaughter this summer. Everything I made looked like something an aging, not very skilled hippie would construct, sort of new-agey and psychedelic.